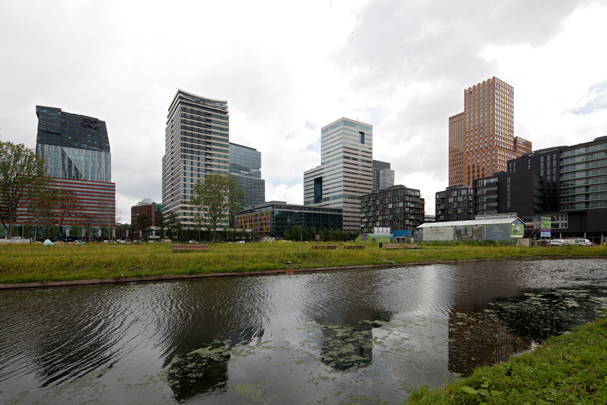 Mahler 4 is the first component on site of the ambitious Zuidas (Southern Axis) development corridor, a new metropolitan centre of offices, housing and services on Amsterdam's southern ring road. The existing railway line and the A10 motorway, to be laid in a tunnel tray more than a kilometre long, cross the forthcoming North-South metro line to the city centre. Near the existing Zuid railway station and the renovated World Trade Centre lies Mahler 4 whose buildings include Rafael Viñoly's office tower with an outside stair winding its way up the facade, Erick van Egeraat's massive outcrop The Rock, the golden towers of Pi de Bruijn's Symphony, Norman Foster's Vivaldi, UN Studio's Escher-like facade, Toyo Ito's stepped office tower and de Architekten Cie.'s New Amsterdam housing block. John Bosch, FOA, SOM and Michael Graves designed the remaining low-rise offices.